I actually forgot I had preordered the ZAGGmate keyboard case for the ipad and it arrived today which was a pleasant surprise. Since it works as a case it’s a very simple way to enhance the potential productivity without actually adding something new to carry. I’ve become quite accustomed to typing on the screen over the past months, but its hard to beat real keys for speed. The ZAGGMate itself sets up in a few seconds. Turn bluetooth on, activate the keyboard bluetooth function and confirm the code and boom. Just like every other bluetooth accessory I’ve tried over the years. The keyboard (on which I’m now typing) feels good. The keys are small and I’m actually making plenty of typos, but this is literally the first thing I’ve used it for and I expect that like all keyboards, I’ll have it figured out shortly. I like the key travel and in general I can see really enjoying having this as part of my kit. 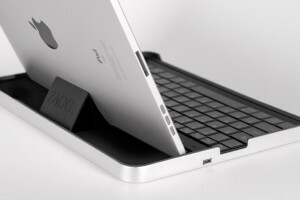 There are some special keys and functions which let the ZAGGmate make the iPad function more like a computer. With dedicated keys for search, home, hiding or showing the keyboard and concealing your screen it’s nice… I also like that there are some command functions like undo for example which I’ve also used while typing this. A quick test of of the setup on my lap and its confirmed the ZAGGmate is a solid release. 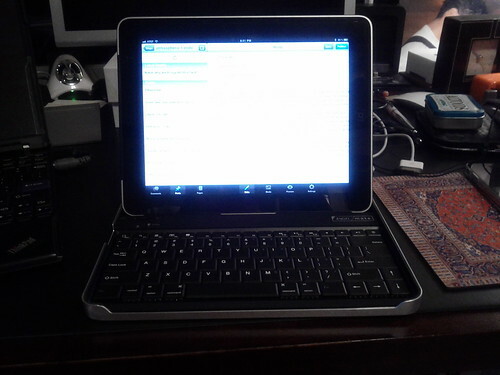 I love that this case (and a few others I’ve seen) essentially turn the iPad into a netbook, lol. Joking aside, it looks like a really nice piece of kit. I’m curious as to what happens when you close it, though. Do you have the option to leave the screen out, so you can still use the tablet with this case attached? Or does it close with the screen inside, so it’s more of a carrying case than a full-time-use case? I use the iPad constantly. I can do a real days work on it if I don’t have to produce any real documents. Working in mail, taking notes etc. All good. A keyboard just makes that more efficient. Have to see if I stick with it as the main case I use, Apple’s is so slim.